by Michelle Y. Talbert, Esq. The audience sat rapt listening to Dwight L. Peters, the founder of crowdfunding startup BackersHub, share about his journey to become a tech entrepreneur in Silicon Valley. 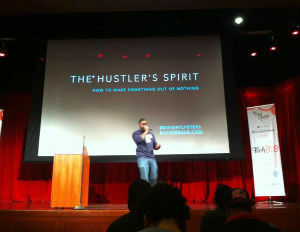 On a sunny day in November 2014 the auditorium at NYU’s Kimmel Center was filled to capacity as budding entrepreneurs answered the call put forth by the founders of The Phat Startup to attend the first ever hip hop inspired technology and startup conference, Tech808. As one of the speakers, Peters shared his journey of attempting to start different ventures and what happened to his mindset when he hit financial rock bottom, while sleeping on his friends’ sofa. That moment led him to start BackersHub a company founded when Dwight identified that crowdfund Backers had a pain point that he was equipped to solve. According to research conducted by Ventureneer,Â crowdfunding is an excellent source of capital for women entrepreneurs, and when I inquiredÂ president and founder Geri StengelÂ stated that the positive effects can be applied to minority communities, as well. The possibilities for fundraising by entrepreneurs through crowdfunding received a welcomed boost in 2013 with the passage of Title II of the JOBS Act that should also benefit women and people of color entrepreneurs. In choosing to found BackersHub, Dwight saw a need in the marketplace to connect fundraisers with folks who’d previously invested in other campaigns and were eager to continue to invest in quality campaigns. BlackEnterprise.com caught up with Dwight to talk about his entrepreneurial journey and to get his tips for folks interested in raising funds AND, equally important, investing in campaigns. BlackEnterprise.com: When did you realize you were an entrepreneur at heart? Dwight L. Peters: As a child I had a strong creative background and most of my time was spent heavily focusing on the arts. The concept of creating something that never existed before and bringing it to life was something that I was greatly intrigued by. I had entrepreneurial influences around growing up as my stepfather and uncle were entrepreneurs. I collected comics and trading cards as a child and would try to sell them to the other kids in my class (to no real great success). However, I learned at an early age that a person can create a living for themselves by creating and providing value. What types of businesses did you launch or attempt to launch before founding BackersHub? Before BackersHub, I launched several attempts at a business – with each one leading me towards BackersHub. First was QuarterWaters [editorial note: If you grew up in a city, especially New York, you know this colloquial reference for the little drinks in plastic containers with foil caps] – a weekly podcast where I interviewed Social Entrepreneurs to have them share business tips, talk about the issues they were tackling and inspire others to get started. 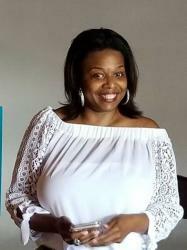 Michelle Y. Talbert, is a recovering attorney and writer who hosts the podcast, 'Her Power Hustle.' She recorded her first podcast episode in 2009 and launched Her Power Hustle in early 2015 in response to being overwhelmed with inquiries for success and networking help from women entrepreneurs. Through interviews from the entrepreneurial trenches and sharing resources and tips, the podcast and Her Power Hustle Facebook Community provide inspiration and motivation to empower women for the perspiration associated with being a woman entrepreneur. She has interviewed business and media titans including Dave McClure, Guy Kawasaki, Pat Flynn and Black Enterprise's own Caroline V. Clarke and Paul C. Brunson. In 2015, she was invited to the White House by its Office of Digital Strategy to cover President Obama's State of the Union Address from the White House as a Social Media Influencer, and has been featured in EBONY, Forbes and USA Today. Her 'Her Power Platform Program,' helps entrepreneurs and other creatives create beneficial relationships Online and In Real Life AND Get a Return of Value on those Relationships. Michelle is a native New Yorker but you can find her loving life in South Florida.